Scrap metal has grown into nearly a $100 billion industry, and there's room for many people to earn money from it. For the past several years, foreign countries, led by China, have been buying recycled metals, driving the prices for scrap copper, bronze, aluminum and other metals to record highs. Metal is a commodity, bought and sold on public exchanges, and prices fluctuate like prices on stock markets. A great scrap-metal payday is never a sure bet. Still, when you collect and sell scrap metal, you help clean the environment, recycle a resource and earn some pocket money. Take a good look around your home, basement and neighborhood for old metal pieces and things you no longer use, and may not even recognize. Almost anything made of metal is worth something, but copper, brass and aluminum have the highest resale values. Old cords and cables for telephones, computers and other electronics contain copper wire, a top-paying item at scrap yards. Small machinery, old pots, hinges, pipes, grills, old washing machines and car parts are examples of some of the things that can be sold for scrap. Spread out and search your neighborhood, local parks and roadways. Community landfills, dumps, waterways and marshes are also places to collect scrap metal, particularly aluminum cans. Usually, 32 aluminum cans weigh about one pound, which is worth about 35 to 55 cents at the time of publication. Some metal scrappers stomp or flatten aluminum cans to conserve space. Ten states now require deposits on beverage containers, and scrap hunters can usually earn $1.55 by bringing a pound of aluminum cans sold in that state to a redemption center. Find a local scrap metal yard or recycling center online, or through the yellow directory. When you get to the scrap yard, a dealer will sort and weigh your metal. 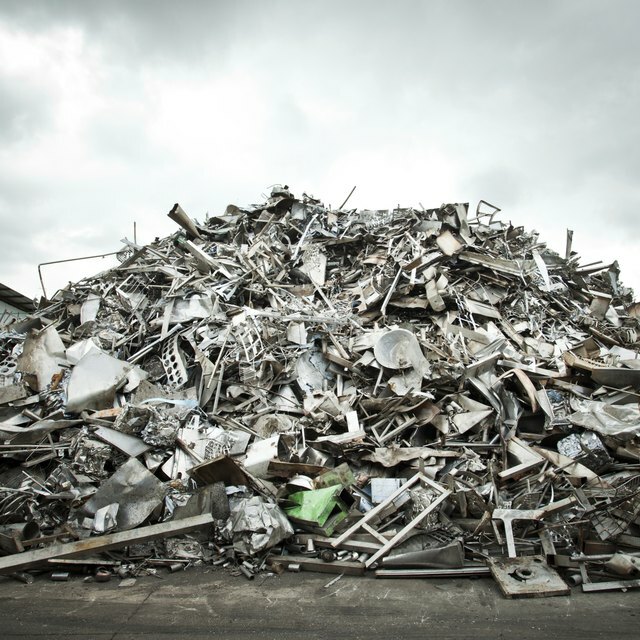 Scrap yards buy metals by the pound, and many pay higher prices for larger amounts, usually 50 pounds, or more. Some sellers wait and collect a good pile before hauling it to a scrap yard to sell. You can also check the daily metal prices online and plan your trip when prices they are on an upward track. Metal prices listed on commodity exchanges are for raw or freshly mined metal, and are higher than scrap prices. Scrap metal follows the raw metal price trends. Some scrap yards list prices on their websites and most will quote rates over the phone. The recent spike in scrap prices has triggered a nation-wide wave of metal theft, and most scrap yards require sellers to show a photo I.D. for each sale.